VERONA AND THE WATER Each single drop of water which caresses Verona, transports ancient and new memories of energy and of life Half day guided tour to know the beautiful Verona through its waters. The heart of the city is in the sweet hug of the river Adige, as for the project of the Romans. The river has always had a fundamental role in the history of the town and Verona developed over the centuries following its course. But this is not the only water to flow in Verona: fountains, springs, wells and old water-ways make the city magic. The tourist guide will lead you for an interesting walk to discover well- and less known spots and will tell you about Verona and its exciting water life. Booking for this event is required, at least 12 hours before the start. ASSOGUIDE VERONA is a group of highly qualified registered tourist guides who love their job passionately and costantly update their knowledge . 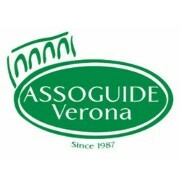 ASSOGUIDE VERONA was born in 1997 and, since then , costantly works in the city and in the Province of Verona to offer services in many languages: Italian, English, French, Spanish, Portuguese, German, Russian, Dutch, Finnish, Japanese, Rumanian and Turkish.